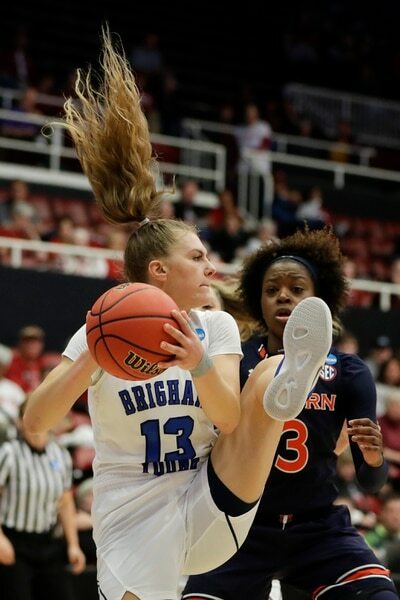 Stanford, Calif. • There came a moment late in the fourth quarter on Saturday when BYU’s women’s basketball team was truly tested. 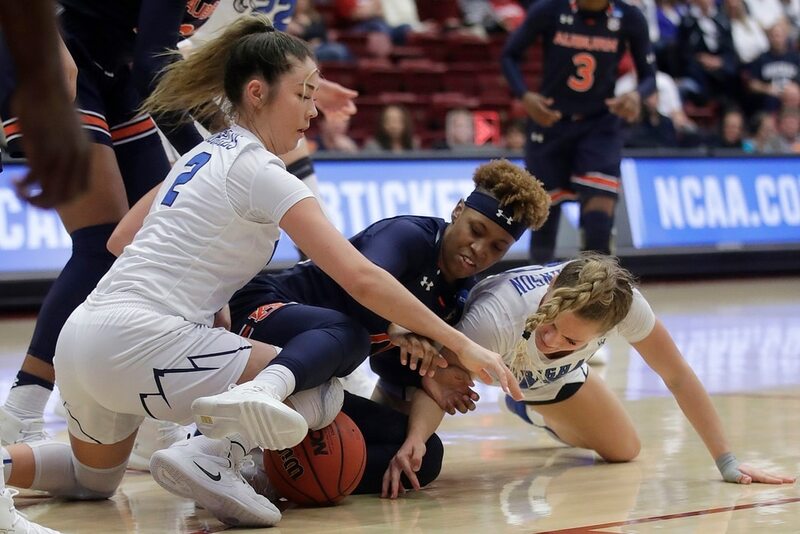 The Cougars had gone up on Auburn by as many as 15 points in their first-round game of the NCAA tournament at Stanford. And in a blink of an eye, the lead was down to four. It was Brenna Chase time. The junior guard promptly drove to the basket and drew a foul from Auburn’s Erica Sanders. Chase made both free throws. A Tiger turnover followed. Shaylee Gonzales made a layup. Suddenly the Cougars had breathing room en route to a 73-64 win. Seventh-seeded BYU will face No. 2 seed Stanford on Monday in the second round. Chase finished with 19 points while Gonzales finished with 17. Caitlyn Alldredge added 14. The Cougars (26-6) played a phenomenal defensive game, especially after abandoning their man-to-man defense midway through the first quarter. 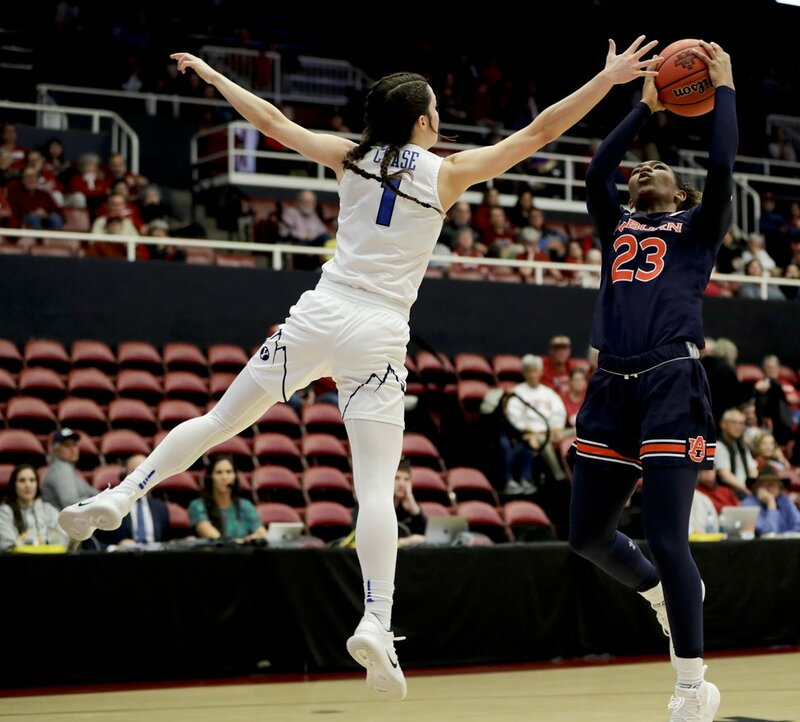 BYU held Auburn to 32 percent (24 of 75) shooting from the floor including 15 percent (four of 27) from 3-point range. • No. 7 seed BYU goes up by 15 points and hangs on down stretch against 10th-seeded Auburn. • The Cougars hold Auburn to 32 percent shooting. • Brenna Chase leads BYU with 19 points. Early on, it looked like BYU might be in trouble. With more height across the starting lineup, the Tigers were killing the Cougars on the boards, holding an 11-2 advantage when the television timeout was called. Auburn led 9-4 at that point. That was when Judkins went to the zone. “We worked all week on our man-to-man,” he said. “We thought our man could do a good job containing them and keeping them off the boards. As we well know, things change in games. Every time it seemed like Auburn was poised to make a run, BYU responded. Early in the third quarter, consecutive baskets by the Tigers tied the score at 30-30. The Cougars then went on an 11-1 run to take control. Late, Auburn’s pressure finally seemed to rattle BYU. On consecutive plays, the Cougars got the ball to Sara Hamson — at 6-foot-7, the tallest player on the court. But both times she tried to hand the ball off and ended up turning it over, leading to fast break baskets for Sanders and Crystal Primm. Those started an 11-1 run to cut a 64-50 lead down to 65-61. 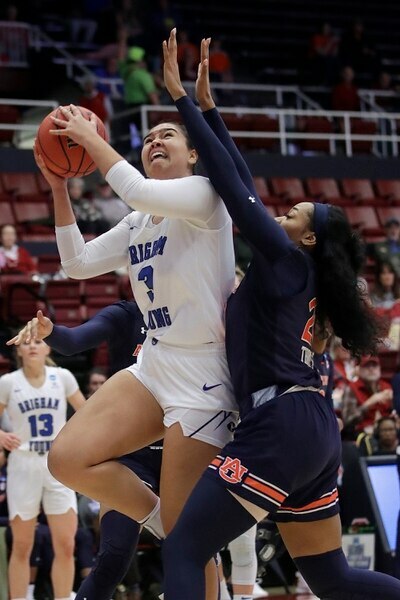 Janiah McKay fought through a sore Achilles and cramps in her quad to score 19 points, and Daisa Alexander added 14 for Auburn.